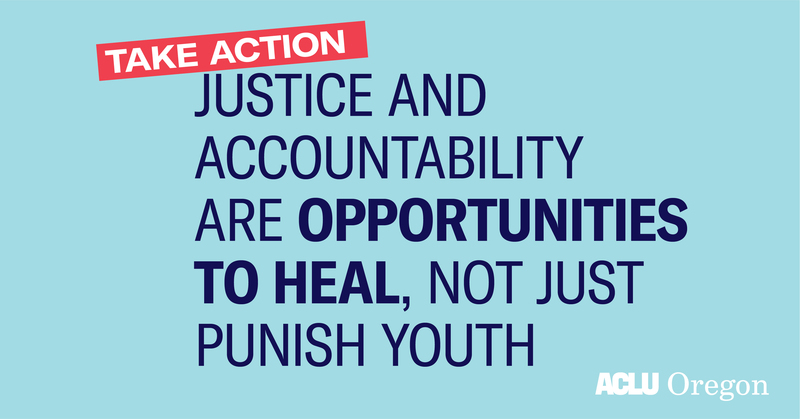 Youth in Oregon’s justice system should be held accountable for their mistakes. But we all know the value of forgiveness and second chances. When young people cause harm, we need to help them make a positive contribution to society through rehabilitation, education, and opportunity. Senate Bill 1008 would help bring our youth justice system in line with what we know works. SB 1008 was passed by the Senate on April 16, and now it's on to the House of Representatives. Use the form below to tell your legislators to support SB 1008 to ensure our youth justice system focuses on accountability and rehabilitation, not on placing youth in adult prisons. I am writing today to urge you to support reforms to Oregon’s youth justice system by approving SB 1008. First, SB 1008 establishes a process where all youth who are convicted in adult court have access to a "Second Look" hearing half way through their sentence. At that hearing, a judge determines whether the youth has taken responsibility for their crime and been rehabilitated, which would allow the remainder of their sentence to be served under community-based supervision, rather than being incarcerated. Second, SB 1008 places youth accused of any crimes in the juvenile justice system, instead of the adult justice system. To move a youth to the adult justice system, prosecutors would need to request a special hearing with a judge who would decide where youth are placed. Third, SB 1008 would require an opportunity for a judge to release a youth before they are transferred to an adult prison, as long as the youth has less than two years left on their sentence. And fourth, SB 1008 would eliminate life without parole sentences for youth in Oregon by establishing a process to ensure that anyone convicted of a crime when they are under 18 years old receives a chance for parole after 15 years of incarceration. Like a majority of Oregonians, I believe that Oregon’s youth justice system should focus on rehabilitation and prevention. I also believe that we should focus on healing youth, not just punishing them, so they can become productive members of our society. We should shift to what works. Studies show youth who are placed in the adult justice system are over thirty percent more likely to commit additional crimes upon release than those in the youth justice system. Placing youth in the youth justice system is better for the youth and keeps our communities safer.